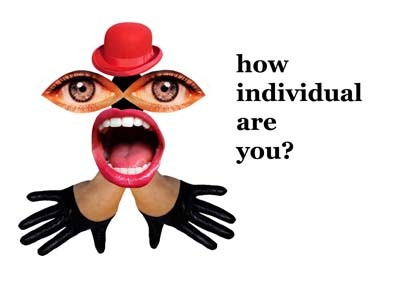 Quizzes › Individual › How Individual Are You? A short test to find out just how individual you really are! How defined is your daily routine? How much does it bother you if a plan changes at the last minute? I don't care - it's more exciting this way! How easy do you find it to come up with possible solutions to difficult problems? How often do you disagree with other people's opinions? If given the chance to move across the world, but in only 1 week's time, would you do it? What's most important about what you wear? How would people usually describe you? What is the best thing about a holiday? And finally, on a scale of 1-10 (10 being the highest) how individual do you think you are?